Showcases my hand-crafted work and designs. 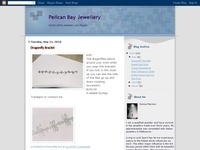 I’m a qualified jeweller & worked in the trade over 30 years. A major influence is the Art Noveau period with its beautiful organic flowing lines. Gents sterling silver ring tried to work out the traditional twist and plate of Latvian male ring design. Its not exactly the same but my husband who has Latvian heritage loves the ring any way. A one of handmade 9kt pink gold leaves and sterling silver vine pendant set with a natural form tourmaline watermelon crystal. this pendant sold with in a week of making it.